ANN ARBOR — All season, the Michigan basketball team has been hearing about the 1989 national champs. It is the 25th anniversary for the only Wolverines team to win a national title, and the constant reminders could have been painful for a team that game within one victory of matching the feat a year ago. Instead, the 2014 squad has embraced their older colleagues, using them as inspiration for an improbable title run of their own. It all came together Saturday, when, on the day the 1989 champs were being honored at the Crisler Center, the Wolverines beat Minnesota 66-56 to clinch a share of their second Big Ten title in three years. "Those guys helped us win the game at Michigan State a few weeks ago, because our kids watched the Big Ten Network special about them, and it really inspired them," Michigan coach John Beilein said. "Then it was huge having them here this weekend. Six of them talked to our kids yesterday about what it means to win championships, and how they didn’t win the Big Ten that year. That really had our kids ready to go." When the Wolverines took the court, Beilein was the only one who knew a Big Ten title was even possible. Illinois had just upset Michigan State at the Breslin Center, meaning Michigan could clinch with a victory over the Golden Gophers, but he didn’t tell his players. Actually, he wished he didn’t know at all. "I found out when we were coming out onto the floor, and Whoever told me pretty much ruined my evening," he said. "I’m serious. I didn’t want to know what happened with State until after our game finished." Even without the knowledge that they could become the first Michigan team to hang banners in three straight years since Cazzie Russell led the Wolverines to three straight Big Ten titles and two Final Fours from 1964-66, the players looked nervous early in the game. They trailed 15-9 midway through the first half as open jumper after open jumper fell off the rim. Finally, though, Nik Stauskas started to make plays. Stauskas busted out of his shooting slump by hitting 5-of-8 3-pointers, aided by a pep talk from the star of the 1989 group — Glen Rice. "My shot felt better yesterday in practice than it had felt in a while — I think I made 48 of my 50 3-pointers," Stauskas said. "But Glen told me that he could make 15 in a row with his eyes closed, and now I’ve got to start working on that. I don’t know if you will see that one on YouTube or not." Stauskas finished the first half with 11 points, but he also woke up a quiet Crisler crowd with two alley-oop lobs in the final 90 seconds of the period, both slammed home by Glenn Robinson III. That gave Michigan a 31-20 at the half, and that’s when word leaked to the players that Michigan State had lost. "I think it was Jon Horford who found out and told us, but it still didn’t sink in for me," said Jordan Morgan, the team’s only senior. "I didn’t realize that meant we could clinch until after the game." Morgan helped finish off a Minnesota rally in the final four minutes, teaming up with little Spike Albrecht on a key sequence. Leading by just two points, Michigan had missed a jumper, but Morgan was able to tie up the rebound, giving the ball back to the Wolverines. He then missed a shot of his own, but Albrecht burst into the paint, tipped the rebound over a bigger defender and grabbed it as he flew out of bounds. He still had the presence of mind to flip the ball back to Morgan, who laid it in among a crowd of Gophers. 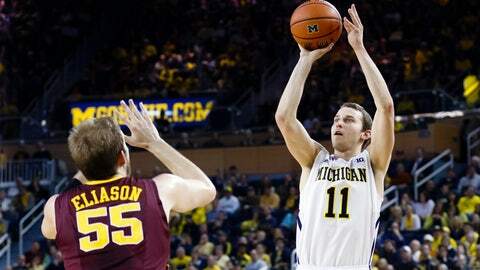 "That was the biggest sequence of the game," Minnesota coach Richard Pitino said. "It’s a two-point game, and we forced two missed shots, but they managed to get the ball back both times, and get a really tough bucket underneath. We never got back into the game after that." Offensive rebounds aren’t exactly Albrecht’s speciality — that one was just his fifth of the season — but he thought it was the right moment to break his usual routine. "It was pure instinct," he said. "I’m supposed to get back on missed shots, but I just had the feeling I could get to that ball. I did, but it was J-Mo who made the shot with three guys around him. That was huge." The Wolverines shut the door defensively after that, and moments later, they were singing the fight song with Rice, Terry Mills and most of thd 1989 team. The most notable absentees were coach Steve Fisher, who had a game Saturday night with San Diego State, and title-game hero Rumeal Robinson, who is in prison. "It made this so much better to be able to celebrate with those guys," Morgan said. "Those guys did something that no other team at Michigan has ever been able to do, so we obviously look up to them. It was special to be in the locker room, singing ‘The Victors’ after clinching this title, and having those guys in there singing along. They were really enjoying it."